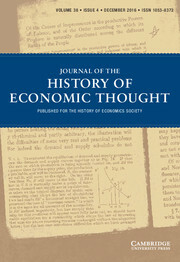 HES members receive a one- (or three-) year subscription to JHET with their annual (or three-year) membership, which includes electronic access to the journal and all the issues of the Society’s preceding publication, the History of Economics Society Bulletin (1979-1989). To get online access to the journal, submit a paper, or find information about institutional or non-member subscriptions, please see JHET‘s web page at Cambridge University Press. Online access is also available through a link in the membership area of the HES’s website (login to your account).